Surat based STPL, well known for its advanced technological solutions for the diamond industry, was winners of the "FICCI Platinum Level Quality Systems Excellence Awards for Industry" distributed at Delhi on April 24, 2018. The winning companies received their awards from Ms. Surina Rajan, the Director General of the Bureau OF Indian Standards (BIS) at the 6th edition of the awards ceremony held as part of the a FICCI conference on 'Sustainable Industry Growth through Quality Systems'. The awards recognise excellence in the field of innovation and standards in safety and performance, ingrained in the value systems, STPL said in a release. 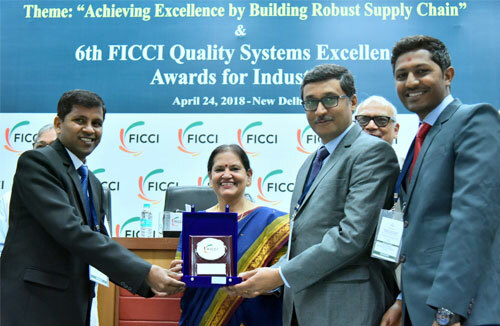 The FICCI Quality Systems Excellence Awards were presented to 11 companies in large, medium and small categories in construction, power, mining, and manufacturing. 17 other companies received a Certificate of Appreciation in these categories. STPL received the Platinum Level recognition edging ahead of well known companies such as Honda, HUL, L&T, and Siemens, the Company said. Speaking on the occasion, Ms. Rajan underlined the need to evolve and promote quality standards that are realistic and implementable, address technology gaps and skilling issues to make Indian products of world-class quality. She said, "STPL, though being a mid size company, has set an example for the entire industry to follow." STPL said it has been successful in developing value based, quality processes for product development. Adhering to the international standards, the company has creatively integrated values in the processes in such a way that the diamond industry is able to achieve global excellence using the products of STPL, it added. Bhargav Kotadia, Executive Director, STPL said, "Creating value adding and quality driven innovation processes is what STPL is known for. As a pioneer of laser technology and trendsetter of the diamond industry, we are engaged in developing and delivering excellence that can help Indian products stand out at the global level." Rahul Gaywala, Chief Executive Officer, STPL said, "Recognition from a prestigious national level institution like FICCI is certainly a great pride for us. At STPL, we have always strived to integrate values in the process of innovation and excellence as our innovations are aimed at solving larger problems of the industry. We believe in setting standards that can bridge the technology gaps and increase the quality and quantity of the products. It is heartening to see that FICCI jury has appreciated our approach."